Although the geographic range of Cladium mariscoides covers perhaps 1/3 to 1/2 of Minnesota, the species is quite rare in the state. It is most easily found in the calcareous fens in northwestern Minnesota, although there is a chance of finding it in just about any well-developed, high-quality rich/calcareous fen north of the Minnesota River valley. Fens are fragile wetlands that can sustain very little human use, and have proven very difficult to restore in cases where damage has occurred. Efforts to protect fens from harmful activities have a mixed record in Minnesota. In particular, the smaller, more isolated fens (those fens not associated with large wetland systems) have suffered severe losses as a result of groundwater appropriations, agricultural expansion, surface water diversion, gravel mining, and other consumptive uses of natural resources. Besides fens, C. mariscoides has also been found on lake shores, although far less often. Finding a self-sustaining population of C. mariscoides on a lake shore is indeed a very rare event in Minnesota. Cladium mariscoides was listed as a special concern species in Minnesota in 1984. Cladium mariscoides is a relatively large, coarse perennial sedge with narrow grass-like leaves. The stem is stiff, round, and sometimes reaches a height of 1 m (39 in.). The inflorescence is terminal, or sometimes terminal and lateral, with stiffly ascending branches and numerous spikelets in groups of 3-5 (Tucker 2002). The inflorescence typically has a dark reddish or reddish brown color, which greatly aids in field identification. 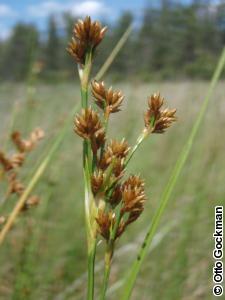 It is most likely to be mistaken for a large rush (member of the genus Juncus). In Minnesota, C. mariscoides occurs mostly in fens, particularly the types of fens that ecologists call prairie rich fens, northern rich fens, and calcareous fens (Wheeler et al. 1979; Glaser et al. 1990; Minnesota Department of Natural Resources 2003). These are sunny, wet, sedge-dominated habitats with a substrate of saturated, sedge-derived peat. Cladium mariscoides occurs secondarily on lake shores, where it will typically be emergent from 10-40 cm (4-16 in.) of water. The substrate in lake habitats is usually coarse sediments like sand or gravel, or even large rocks; occasionally it is found in finer sediments like silt. These are generally undeveloped shores of northern, soft water lakes where water quality is high. The flowers of C. mariscoides are pollinated by wind, and the seeds (achenes) are primarily dispersed by small animals and water. Although reproduction is primarily sexual through the production and dispersion of seeds, populations can expand clonally by the growth of horizontal rhizomes below the surface of the substrate (Bernard et al. 1985). In some cases, it is possible to distinguish individual clones that may be 10 m (33 ft.) or more across. These clones are long-lived (in stable habitats) and compete well with Carex spp. (sedges), Scirpus spp. (bulrushes), and other herbaceous plants that typically occur in the same habitat. However, C. mariscoides cannot compete successfully with large shrubs or trees that may invade if habitat conditions change. Fen habitats are typically kept free of large shrubs and trees by periodic wildfires, which do little if any damage to the buried rhizomes of C. mariscoides. The best time to search for C. mariscoides is when flowers or seeds are present, during the months of July, August, and September. Management of lake shore populations of C. mariscoides is pretty straightforward - maintain the native emergent vegetation in the littoral zone of the lake, and retain an upland buffer zone of native shoreline vegetation for a minimum distance of 15 m (50 ft.) back from the shore. Avoid all use of aquatic herbicides in the lake, and all terrestrial herbicides in the upland buffer zone. Management of fen habitat can be more complicated because the groundwater that sustains fens is usually regional in extent. In other words, potential changes to the quality, quantity, and movement of water far beyond the actual boundaries of the fen must be taken into account in order to assure the continued health of the fen. Smaller, isolated fens may also be vulnerable to invasion of non-native shrubs such as Frangula alnus (glossy buckthorn), which should be removed entirely and quickly. Under certain circumstances, such as a policy of fire-suppression, even native shrubs such as Salix spp. (willows), Betula pumila (bog birch), and Alnus incana ssp. rugosa (speckled alder) may become overly abundant or overly large. The native shrubs should not be eradicated, but kept at natural levels by use of prescribed burns or, in extreme cases, manual cutting. Several populations of C. mariscoides occur in habitats that are owned by public land management agencies. Most, although not all, of these habitats are being passively managed for conservation purposes. However, the efficacy of current management on the conservation of C. mariscoides has not been assessed. Bernard, J. M., F. K. Seischab, and G. Jacoby. 1985. Life history and production of above- and belowground structures of Cladium mariscoides (Muhl.) Torr. in a western New York fen. Bulletin of the Torrey Botanical Club 112(3):288-294. Glaser, P. H., J. A. Janssens, and D. I. Siegel. 1990. The response of vegetation to chemical and hydrological gradients in the Lost River Peatland, northern Minnesota. Journal of Ecology 78(4):1021-1048. Tucker, G. C. 2002. Cladium. Pages 240-242 in Flora of North America Editorial Committee, editors. Flora of North America north of Mexico. Volume 23. Oxford University Press, New York, New York. Wheeler, G. A., P. H. Glaser, E. Gorham, C. M. Wetmore, and F. D. Bowers. 1979. Contributions to the flora of the Red Lake Peatlands, northern Minnesota. Contribution 157, Limnological Research Center, University of Minnesota, Minneapolis, Minnesota. 88 pp.